... to all my friends and family -- yes, that includes you. Tomorrow is Thanksgiving Day and the beginning of a 4-day holiday weekend. I truly hope you have a wonderful day, considering all the blessings Heavenly Father has given you and yours. I know I'm very grateful for my family, my wife, my children, and my grandchildren. I'm also thankful for my mom and dad, my sisters and brother, and their families. They are all special to me, even though I don't get to see them very often. I'm grateful for Heavenly Father's plan for us, that we can be an eternal family. In my mind, heaven wouldn't be heaven without all of them there with me -- assuming I make it, lol. Today I finished reading a novel for review. It was horrible. I won't go into detail, but lets just say the writer needs a lot of help. I'm not saying this to be critical, I'm sure someone could criticize my writing too. But his grammar, syntax, and punctuation were horrible, and his story line was hidden behind many info-dumps, over done descriptions, and cliche's. His story didn't even begin until about chapter 4. The first chapters were all info-dump, descriptions of the setting, etc. I only mention this because as I know you all want to be authors, I urge you to get some professional editor or a good critique group before exposing it to the world. It took me nearly 25 years to get Bridgetown High right, and I still get criticized for some of the characters' dialogs. Well, I've mentioned that before, that some of the characters, to be true to the their personalities, their speech patterns were crude. Face it, a high school drop out probably doesn't speak as fluently as a college professor. "I attended high school in Crockett with the Author, and while this is fiction he leaves you with the feeling that perhaps it may not be. The book is hard to put down, the characters are interesting, and Paul provides enough background to bring the 1960's community of Crockett and Rodeo to life. I enjoyed the way Paul included many of the characteristics unique to the community but still not difficult for someone who's unfamiliar with the area to imagine. He brought back memories of the fog drifting on the bay, the emergency and noon whistles, the C&H Sugar factory, The Dog House, and the well traveled road between Crockett and Rodeo. Let's hope we hear more from Paul about Bridgetown and perhaps other stories he has to offer." Anyway, I'm sure you've heard about the sale I'm running for Bridgetown High. It's FREE until Saturday. 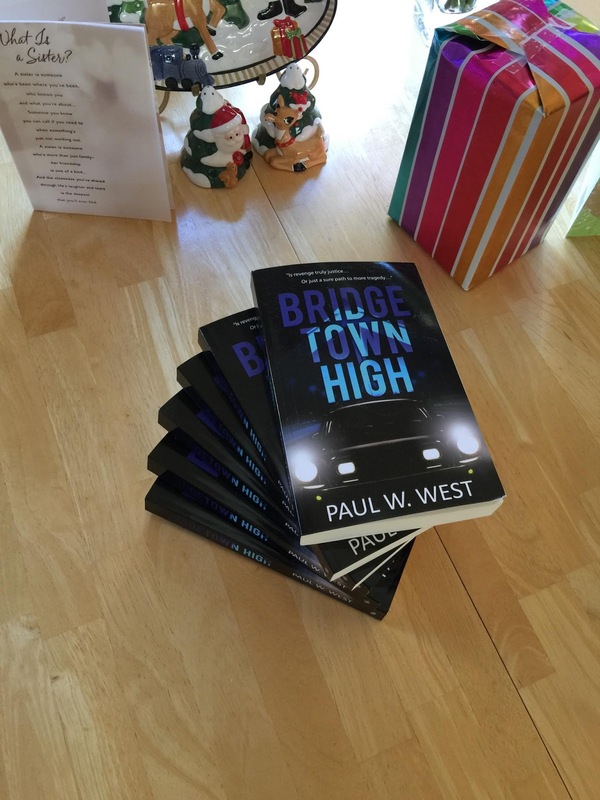 So, if you haven't got a copy of Bridgetown High yet, Go to Amazon and get it at https://www.amazon.com/Bridgetown-High-Paul-W-West/product-reviews/1680583093/ref=cm_cr_dp_synop/156-3883310-2205657?ie=UTF8&showViewpoints=0&sortBy=recent#R2USXC6G2G8RJW. When you do, after you're read it, I hope you'll find it in your heart to write a short review. Then we'll all have something to be "Thankful" for; you for getting my book, and me for the satisfaction that someone is interested in it. More on: 1960s, book review, bridgetown high, critique, critiquing, Editing, editors, grammar, john swett high, john swett high school, novels, paul west, writing. On top of wanting to be an author, everyone wants something for free. Well, your desire for something FREE is about to happen. Next Tuesday, November 22, 2016, Bridgetown High will be on sale for FREE! through Amazon. I hope everyone will take advantage of this sale. I don't do this often. I'd rather get paid for my work, but I've been told that the exposure generated by a freebee is worth it. Gaining exposure is key to selling books. I mean, think about it, if no one know about you and your book, how can they buy it. Okay. One request. You knew there would be a string, didn't you? Well, the string is not attached, so don't get shook up over it. I've asked this before, if you like Bridgetown High, please write a review. It would also help if you Tweeted and Shared this posting with all your Facebook and Twitter "friends" so they'll know about me and my book. Are you willing to do that? You don't have to, but it sure would be nice if you did. So until next week, I won't be posting as usual on Thursday (Thanksgiving Day), but expect me to post again next Wednesday instead. But you can read this anytime you want. So, until then I'll wish you a HAPPY THANKSGIVING!!! Hi all my friends and family. I know it's been several days since I last posted something here. I hope you'll all forgive me, but sometimes work gets in the way of more important things like writing. However, I have been working hard behind the lines, so to speak, marketing my novel "Bridgetown High." By the way, have you purchased a copy of it yet? It's available at Barnes & Noble for an electronic copy or Amazon for a paperback or kindle copy. BUT here is a HUGE SURPRISE toward the end of this month (November 2016) the electronic version will be on sale for FREE, but only for five days. More details about where you can get this deal will be coming. Keep posted. Do I think the book isn't worth anything? NO. So, why am I doing this? It's call exposure. With my book available for free, there are several promo sites that will advertise it for free to all their contacts for five days. My publisher is excited about doing this and is planning a marketing blitz along with new graphics. I'm excited and I hope you will too. Keep in mind, Christmas is coming and this would make a great Christmas gift for your Teens and adults as well.